Global designer and manufacturer of complex passive components for harsh environments, Exxelia, will exhibit at EuMW, in Nuremberg, Germany. From 10th-12th October at booth 190, the company will be showcasing high-rel microwave and RF components dedicated to a variety of demanding industries including medical, transportation and defence. The NHB series is a complete range of MLCC based on NPO dielectric material providing a very high self resonant frequency and limiting the parasite parallel resonant frequencies. The series is available in 1111 size with capacitance ranging from 0.3-100pF. NHB series offers performance for RF power applications at high temperature up to 175°C at 500VDC. The lowest ESR is obtained by combining highly conductive metal electrodes and proprietary of the NPO low loss rugged dielectrics. NHB series is suitable for high power and high frequency applications such as: cellular base station equipment, broadband wireless service, point to point / multipoint radios and broadcasting equipment. Typical circuit applications include impedance matching, bypass, feedback, tuning, coupling and DC blocking. Invar-36 is an Iron-Nickel alloy (64 % Fe / 36 % Ni) sought-after for its very low coefficient of thermal expansion. With 1.1ppm. K–1 between 0-100°C, Invar-36 is about 17 times more stable than brass which is the most traditional and common alloy tuning elements are made of. The working temperature range in Space is so wide that this property becomes essential for a reliable and stable cavity filter tuning. Self-locking system is a technology commonly used on tuning elements made of brass or other soft 'easy-to-machine' alloys but is innovative and pretty advanced when applied to hard and tough Invar 36. 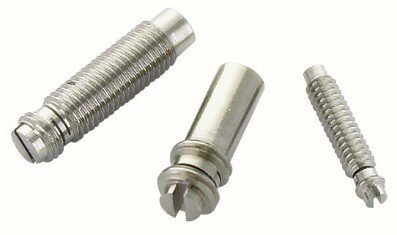 The design consists of two threaded segments separated by two parallel slots. After cutting both parallel slots, the rotor is compressed in its length in order to create a plastic deformation. Thus, an offset is induced between the two threaded segments which generates a constant tensile stress in the rotor from the moment threaded segments are screwed. Dielectric resonators are designed to replace resonant cavities in microwave functions such as filters and oscillators. Exxelia has developed with support of ESA and CNES, a new high-end dielectric material, E7000 series, designed for high-end filters where high Q factor is requested. E7000 is Ba-Mg-Ta materials based that combines an ultra-high Q factor and the possibility to get all the temperature coefficients upon request. E7000 provides high-performance requested for space use in the frequency range 5-32GHz, and guarantees Qxf greater than 250,000 at 10GHZ. Typical applications include satellite multiplexing filter devices, radio links for communication systems (LMDS) and military radars.